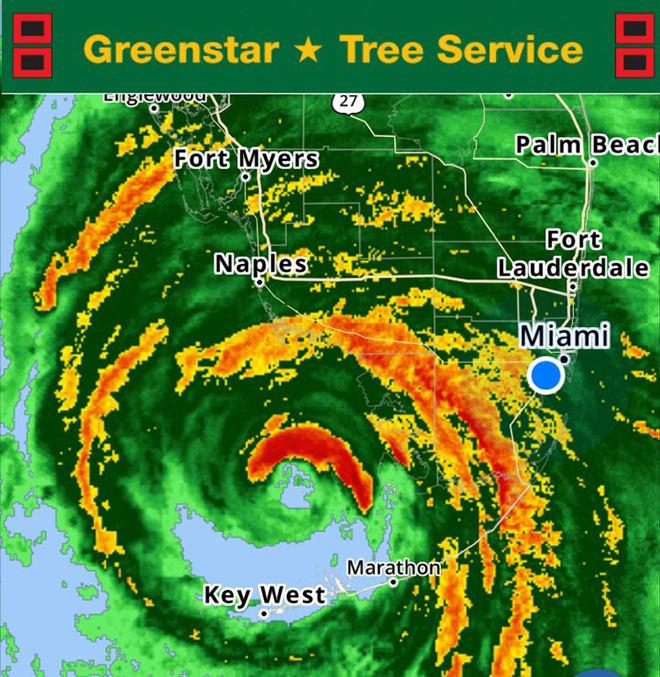 Greenstar Tree Service knows that all South Floridians are concerned with hurricane season, and, of the many things we need to be cognizant of during this season, is if the trees on our property are prepared for a hurricane. Statistically, Miami should see hurricane winds and weather before the end of the hurricane season. Since there has not been significant hurricanes in the area over the last few years, much of the dangerous tree debris rocked loose during a storm has not been removed and is still looming above our heads and homes. During a hurricane or tropical depression, trees that are structurally weak, stressed, diseased and/or damaged can cause serious damage to property, utility lines, etc. by snapping, falling and uprooting. An essential component to diminishing your risk of property damage is storm preparedness. While a hurricane-resistant tree does not exist, with appropriate care and scheduled maintenance, administered by a local arborist, trees can be more resistant to damage from a storm. Peter Masi, owner of Greenstar Tree Service, is a Florida arborist and is well versed in the proper care and optimal growth conditions for South Florida trees. A deep rooted tree may not uproot during a storm, but structurally compromised limbs may break or fall and damage property or become deadly projectiles. Preventive steps, like pruning, can be taken to attempt to reduce or eliminate these damages. Pruning is imperative to hurricane damage prevention. Make certain to schedule an appointment with Greenstar Tree Service a few months in advance to ensure your tree will be strong enough by hurricane season. Improper pruning can prove dangerous during a storm, the incorrectly cut branches are extremely vulnerable to high winds. Seeing as a well-cared-for tree is one of the top ways to shield your home and property from storm damage, having all your trees ready to face the storm is to your benefit. Call today for a tree inspection by Greenstar Tree Service to make sure your property is ready for the Atlantic hurricane season. Severe weather and gravity combine with a tree’s deficiencies and cause continuing damage in a multitude of ways. Click the link to see examples of trees severely damaged by storms. If damage is too extensive and the tree cannot be saved, it will have to be removed. Greenstar Tree Service can help with that as well. Call 305-661-9099 or fill out the form below.